Bought these for my business and I'm satisfied with how they came out. Great customer support from the CEP team. You can count be in as a repeat customer. A lot of options to choose from. Really impressed with this company as a whole. Thank you. Very durable bag. Loved the high quality cotton material. The design on the bag came just the way I had hoped. I'm a VERY happy customer. Very high quality cotton material. Needed this bag to help promote my business at my next convention. They ended up selling like a charm. Thanks CEP. Very impressed with how the bags came out when the order arrived. Not only do I love the cotton handles, but I also like the beautiful appealing logo that you guys made for me to help promote my business. This eco-friendly custom made bag is just what I needed for my business. I sold these advertising my company on the bags and it really helped my business grow as a whole. Thanks. Very impressed with these bags and how great they came out!! this company has earned a five star rating from me. Everything I have ordered from them came the way I designed it and the service that I receive from them is on the ball. I recommend this company. Love them! Def ordering again! Great wholesale bag to order! Perfect size for a giveaway at corporate trade shows and events. This bag fit our catalog perfectly with no modifications necessary. So naturally we ordered this bag and did a basic one color print on the bag and it came out looking great. We placed our newest catalog inside each bag and went door to door handing our customers the newest catalog inside one of these reusable cotton bags. Our customers reaction was priceless as they never have received a reusable bag from us let alone one that is this nice. We love the customer service at custom earth. We only received 75% of our bags, the other 25% were lost from the carrier, So custom earth expedited an order for us and we received the rest of the order about 25% of it in a timely manner and where of the same quality as the original 75% we received. We bought a small space in the annual county fair to promote our business. During the event we handed these bags out to anyone who would listen to our sales pitch. 99% of people were interested in getting the bag so they heard our sales pitch and then became interested in our business, I owe alot of that events success to this reusable cotton bag, big thanks to custom earth promos! This bag fit our season catalog perfectly with no modifications needed. So naturally we ordered it in the natural color and did a basic print on it. We went door to door handing out our newest season catalog inside one of these cotton reusable bags. All the customers were delighted to receive these cool bags with our new catalog for the season. Our law firm uses this bag to give out to all of our clients and all of our employees use it to carry paper work. It is a very strong bag, I rate it five stars. Bulk quantity it is very affordable, I am happy with my purchase. We ordered 2 versions of this bag both blue colors because it went well with our beach themed event. I would use them again. We offer this bag as a goodie bag for all of the children events that we host. The kids love it and moms reuse it all the time for there kids. Received in a timely fashion and the way we ordered it. Lots of options they helped me craft the bag that we wanted. we were very happy with the outcome. good wholesale trade show bag to order. We use it all the time. Good quality, received on time. I suggest this product and service. 8.5" x 11" hand outs and booklets fit perfectly in this bag, great to use for conferences and we even use them for special meetings to impress clients and give them a product with our logo on it that will be reused. for a wholesale bag you cant beat the price and the quality. received our order today and the bags look good, I am excited to be able to pass these out to potential customers. Very professional staff to do business with, they understood our needs and meet them on time. Our Custom Reusable Organic Cotton Mini Tote is efficiently compact and outstandingly cost-effective, the ideal giveaway for clients at your next event! Fashioned out of the eco-conscious and biodegradable cotton fiber, it offers supreme durability and comfort without sacrificing style and affordability. 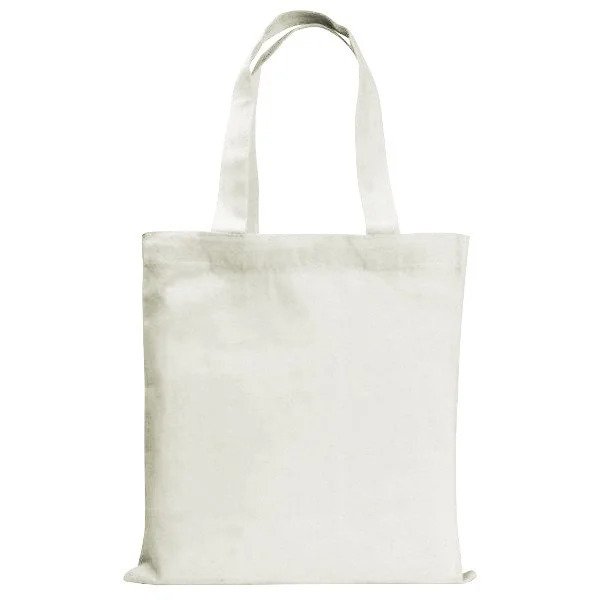 Make a progressive, environmentally sound statement by purchasing this cotton mini tote for your clients today! Whoever declared that ‘less is more’ was on to something! The Custom Reusable Organic Cotton Mini Tote is our eco-conscious personification of this well-trodden adage and arrives in a dizzying array of five effervescent colors. Seamlessly blending practicality, visual appeal, and cost-effectiveness, your clients will be toting this bag around for years to come! Our Custom Reusable Organic Cotton Mini Totes are wonderful for discerning clients who are seeking eco-friendly, compact, and durable bags. Arriving in five chic colors (Black, Natural, Navy, Red, and Royal Blue), this smaller, efficient tote boasts the same aesthetic value as our larger totes and contains a conspicuous 5” W x 5” H imprint area that others will certainly not miss. As always, full customization is possible and the design you elect to emblazon on this tote will tout your brand with eye-catching appeal, placing your business in the spotlight. 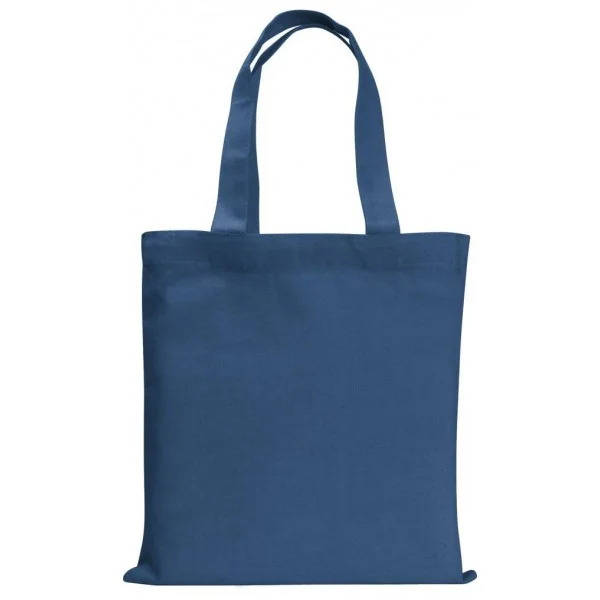 Made of natural, sustainable cotton, this mini tote presents innumerably favorable reasons for its purchase, particularly when considering the material from which it is produced. Cotton is inherently a fiber with much versatility, offering benefits such as comfort, durability, weather-resistance, and insulation and protection from the elements which may damage a bag’s contents. Among the aforementioned characteristics of cotton, durability is a signature feature of this tote. The cotton in this bag is remarkably resilient and can hold heavy items that many conventional totes cannot. Also, your clients will enjoy comfortable, well-stitched 13” handle straps that are well-suited to long-term use. Finally, this cotton mini tote is incredibly cost-effective. Starting at an affordable $0.89, you will struggle to find another tote on the market that offers such a superior blend of quality and inexpensiveness. Every Custom Reusable Organic Cotton Mini Tote fashioned by our specialized, highly experienced overseas manufacturing facility is imprinted with the design, logo, or message of your choice. We only provide the best, highest-quality products at the most competitive, affordable rates in the business and deliver the products to you within your requested deadline. We also make it an utmost priority to provide excellent customer service.